Julia Maud Cocker was born on 21 Apr 1878 in Port Sorell, died on 1 Sep 1936 at age 58, and was buried in Moorina General Cemetery. Although named Julia Maud at birth, she used the name Alice Maud. 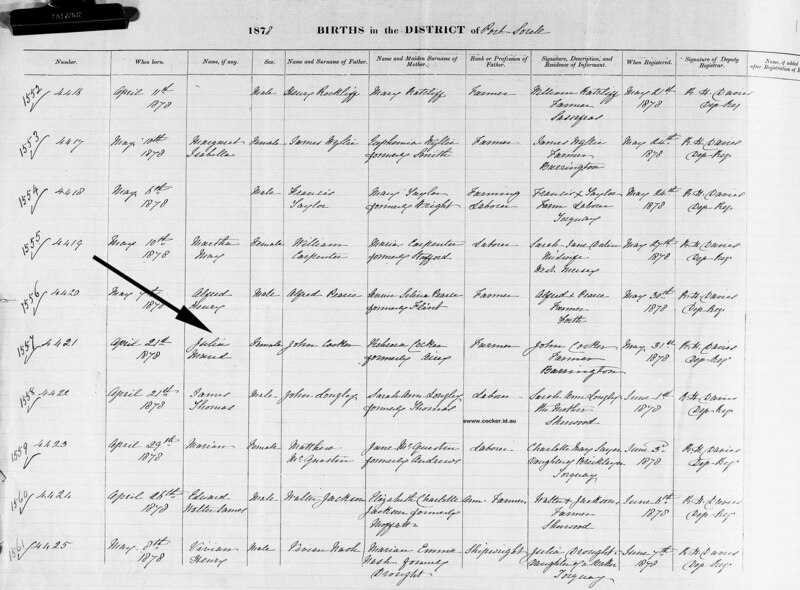 Julia married Richard Charles Ellings, son of Edwin John Ellings and Ann Thomas, both of whom were born in 1845 at Lamorran, Cornwall, England, on 19 Apr 1900 in Methodist Church, Lower Barrington. Richard was born on 5 Jun 1877 in Kaitangirua, New Zealand, died on 7 Jun 1949 at age 72, and was buried in the Yallourn Cemetery, Victoria. 4-Gladys May Ellings was born on 9 Sep 1901 in Lower Barrington, Tasmania. Gladys married John Cahill on 14 Jan 1924 in Derby, Tasmania. 4-Amanda Eileen Ellings was born on 12 Sep 1902 in Lower Barrington, Tasmania and died on 9 May1970. Amanda was usually known as Lena. Amanda married Albert Alexander on 25 Jun 1922 in Pioneer. 4-Agnes Melvina Ellings was born on 5 Nov 1903 in Lower Barrington, Tasmania and died on 4 Oct 2003 in Melbourne, Victoria. Agnes married Frank William Adams, son of Robert Damright Adams and Jessie Biggs, on 25 Dec 1922 in Pioneer. Frank was born on 13 Oct 1898 in Branxholm, Tasmania and died on 23 Nov 1978 in Footscray, Victoria at age 80. They had four children: Pamela Jean, Gordon Bruce, Brian Richard Frank and Roy. 6-Pamela Cameron. Pamela married Frank Goia. They had two children: Debbie and Michelle. 6-Rodney William Cameron. Rodney married Lindy. They had three children: Felicity, Andrew and Sean. 5-Gordon Bruce Adams was born on 13 Jun 1926 and died on 23 Mar 1968 in Heidelberg, Victoria at age 41. 5-Brian Richard Frank Adams was born on 7 May 1925 in Launceston and died on 10 Aug 1990 in Sydney, New South Wales at age 65. Brian married someone. She had one daughter: Janice. 4-John Charles Middleton Ellings was born on 9 Jul 1905 in Barrington, Tasmania. 4-Reginald John Ellings was born on 6 May 1907 in Lower Barrington, Tasmania, died on 2 Aug 1971 at age 64, and was buried in Mersey Vale Lawn Cemetery. Reginald married Ellen Lucy. Ellen Lucy died on 31 Dec 1987 and was buried in Devonport General Cemetery. 4-Richard Charles Ellings was born on 2 Oct 1908 in Lower Barrington, Tasmania and died on 2 Aug 1971 at age 62. 4-Ilma Alice Ellings was born on 2 Oct 1908 in Lower Barrington, Tasmania. Ilma was usually known as Alma. She married Roland Charles Healy, son of Leonard Charles Healey and Emma Louise Watts on 8 Apr 1936. Roland was born at Green Street, Launceston on 23 Aug 1910 and died on 2 Jun 1953. They had four children: Judith Alice, Leonard Charles, Robert James and Janine Louisa. 5-Judith Alice Healey. Judith married Terrance Reiper on an unknown date. 5-Leonard Charles Healey. Leonard married Beryl Webster on an unknown date. Leonard next married Dianne Cole on an unknown date. 5-Robert James Healey. Robert was born on 2 Nov 1944 and married Diane Krushka, He next married Janet Hazelwood, He next married Robyn Wilson. 5-Janine Louisa Healey. Janine married Peter Weston on an unknown date. 4-Grace Ann Middleton Ellings was born on 5 Apr 1910 in Barrington, Tasmania and died on 13 Jun 1927 in Moorina at age 17. 4-Herbert Charles Ellings was born on 9 Mar 1913 in Weldborough, Tasmania. 4-Mollie Lorraine Ellings was born on 1 Mar 1919 in Weldborough, Tasmania. Mollie married Albert Oliver.